Bread is a popular stable in my house. Most weeks I make at least two loaves, sometimes more. Every couple of weeks I try to change up my normal bread routine and try something different such as scones or biscuits. A particular household favorite is focaccia. It takes longer than most breads to prepare and bake, but the end result is well worth the effort. 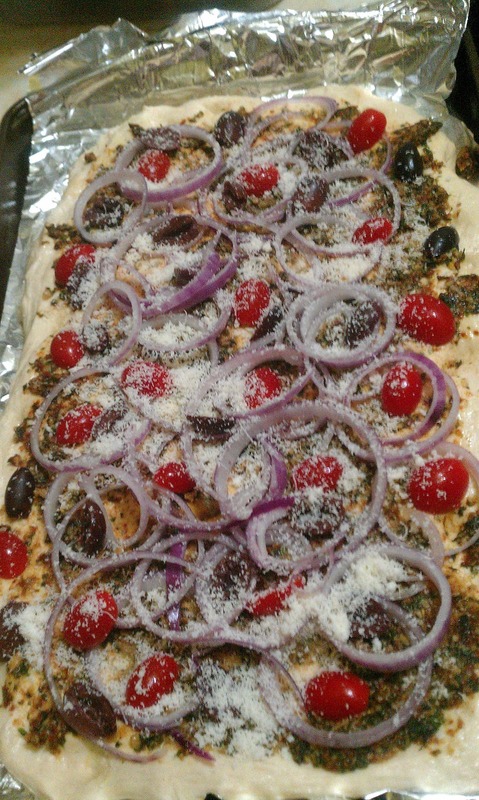 Recently, Saveur magazine had a recipe for Pesto Focaccia using cherry tomatoes and kalamata olives, two foods my family loves. This recipe has 8 ingredients for the pesto and 12 for the focaccia. It makes 12-14 servings and takes approximately 4 and a half hours to prepare and bake. There are a number of ingredients in this recipe, but I only had problems finding one, durum wheat flour. I looked at every store I could think of in my area to no avail, so I chose to leave it out. Instead of the durum wheat flour I used an additional cup of all-purpose flour, making 5 and a half cups of total flour. I noticed that the top of the focaccia cooked very quickly and I had to tent the top after approximately 10 minutes to prevent burning. I followed the remainder of the recipe as written. Over the last five years I have made a number of focaccia recipes, about one every month. I was intrigued by this recipe since it used mashed potatoes and lager beer in the focaccia dough, a combination I hadn't tried in previous recipes. The combination of the kalamata olives and cherry tomatoes worked well together and went great with the sun dried tomato pesto. Overall, a recipe well worth the time involved and filling enough for a main dish or side. For the recipe go to Pesto Focaccia. Hi :) I'm a new follower from The Weekend Blog hop! I'd love if you visited my blog, too. Wow! You make me feel inadequate because I don't bake that much. @Edith Thanks :) I bake a lot because my two boys are both growing and eat a ton of food! I don't even know where to start with these recipes! They are so ridiculously delicious-looking. I'm your newest follower. I don't have recipes on my site, but it looks like you're all set there anyway. :) Feel free to stop by and check it out. @justlucy Thanks for the sweet comments :) Followed you back!